Orloff is one of Denmark’s leading suppliers of workwear, promotional wear, personal protective equipment and footwear for the corporate sector. In Orloff Workwear Store in Odense, Aarhus and Kolding, we present a large collection of well-known quality brands. Orloff is not only supplying company wear, but total solutions. We have more than 25 years of experience in logistics, service and distribution – and the industry’s most modern showroom and storage facilities. We have our own printing houses and we use sophisticated stock management and order systems. We advise about the right choice. About embroidery and print. About colours, sizes and all the other things which you might ask about. We take care of everything. From the first presentation of ideas and until the clothes are delivered to the individual department and employee in the company. We call it ”clothes on time – and as ordered”. But Orloff Firmatøj is more than that. Because in addition, we offer a package solution which is combined to match the needs of your company and that may include: Order forms, individual webshop, picture overview, point control system and catalogue. And of course a competitive offer before we start. We offer more than the others. This is the reason why the staff in a large number of store chains, large industrial companies, public institutions and many trade companies every day wears company clothes from Orloff Firmatøj. This is what we understand by total solutions. 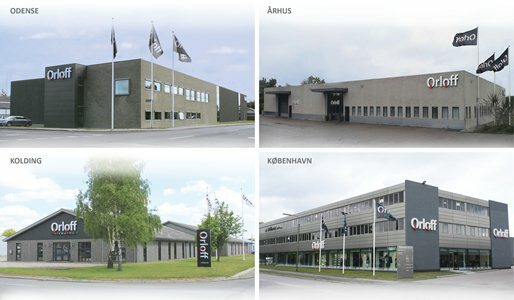 Contact one of Orloff’s employees in Odense, Aarhus, Kolding or Copenhagen.